Introduce students to the fun of music with hands on interactive adventures. 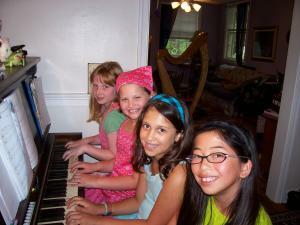 Does your child want to start piano or already plays and wants to have musical fun this summer? Would you child like to experience being part of a community of young pianists? This camp is for beginner level students – not yet reading music or just starting. There is a performance at the end of each week! The Piano Explorer, a national music magazine for kids, has started a Practice Challenge — when the student practices their instrument for 100 days continuously, their name and their teacher’s name appears in the magazine as recognition of hard work. Susan’s students are motivated and many have completed 100 and 200 days of practice and have been recognized by the magazine. Camp Location: Close to Winnona Park – very close to the Friend’s School. Parents are asked to provide snacks. Once your child is registered, a medical information form (provided) covering allergies and emergency information will be requested. Fee: $185 Deposit of $100 due April 1. The balance is due the first day of camp. The sign up deadline is March 30. Contact Susan for questions.